It can be a real disappointment when you’re looking for a new home and only come across communities that all look the same. A home just isn’t a home if you can’t put your personal stamp on it. Instead of conforming to any one model of living, Juhl proudly provides a fresh, open canvas for residents to express their individuality. Juhl floor plans are versatile and provide adaptable flexibility to accommodate the needs and wishes of all who call Juhl home. With resident options ranging from flats and brownstones to two-story lofts and penthouses, you’ll find a home that will exceed your every expectation. Juhl condominium interiors are clean and airy with high, floor-to-ceiling windows provide natural light and extraordinary views of our sparkling pool. Upon entering your Juhl home, it won’t just be the Valley views that take your breath away. Below your ten-foot ceilings, you’ll love the sprawling hardwood flooring, spacious kitchen island or breakfast bar, and sleek stainless-steel appliances. Granite countertops and stylish backsplashes complement the exposed mechanicals and concrete surfaces, giving your space an urban, yet contemporary feel. Not only is your loft style home beautiful, but also environmentally smart, with customized blackout window treatments, low emission window glass, and energy efficient air conditioning and forced air heating. Your perfect home should make you feel as though you’ve lived there forever, yet somehow every day will feel like your first. With these state-of-the-art design features, your home at Juhl will do just that. Smart and stylish comfort isn’t the only thing that Juhl boasts. Our condominiums are built to maximize your lifestyle, whatever that may be. Have you always dreamt of entertaining your closest friends in a large, luxurious 14th and 15th floor penthouse that overlooks the city? Or maybe you prefer getting lost in your own thoughts as you enjoy listening to your favorite vinyl records in your quaintly intimate flat? And there’s just something about a beautifully decorated staircase in a two-story Las Vegas loft that warms our hearts during the holidays. Within a sprawling square block of walkup brownstones, live-work spaces, two-story townhomes, flats, and two-story penthouses, we’re confident that we’ll find you a space that will fulfill your every want and need in a home. 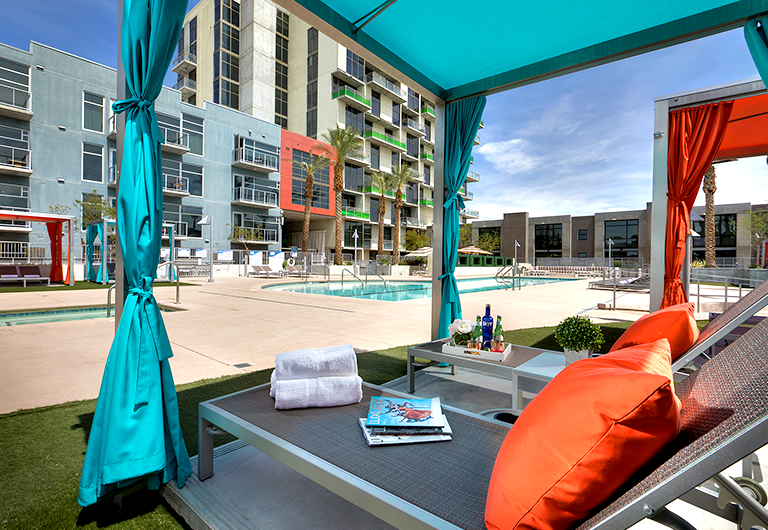 Along with all the comforts of home, residents also indulge in resort-style amenities. Juhl provides a community-centric approach to living that encourages a social atmosphere amongst neighbors and friends. All amenities at Juhl are designed to inspire engagement within our walls so you’ll never be far from a friend. Spend a sunny afternoon at the resort-style pool equipped with cabanas, a spa, and a fire pit. Or get cozy under the stars and watch the big screen at the Alfresco outdoor movie theatre. Other Juhl amenities include a 10th floor Vino Deck, a private pet walk, a two-story fitness center overlooking the pool, summer kitchens and grilling stations, and a co-op working lounge to socialize and network. Our on-site Lifestyle Director is always crafting up new ways for residents to have a great time at and away from home and our events often include wine tasting, game nights, and more! Urban condo living doesn’t have to be cookie-cutter! Some of the most unique people choose to live at Juhl and we strive to match that lifestyle. 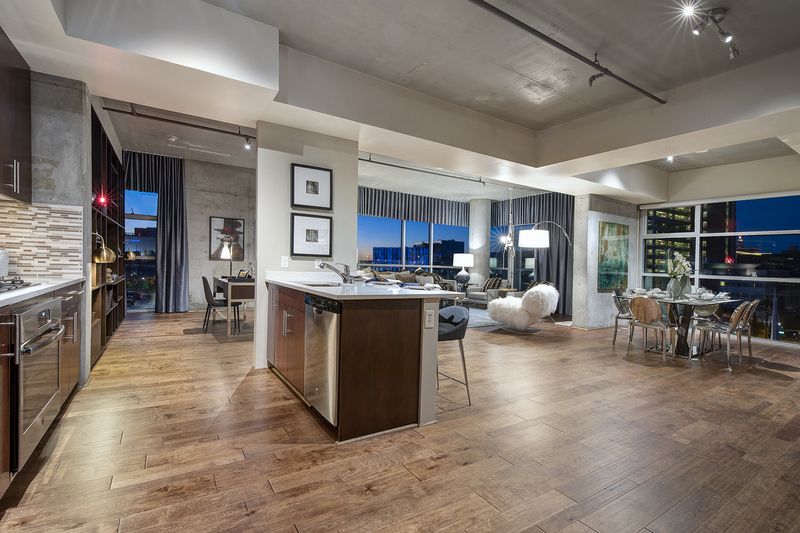 To achieve such an exceptional living experience, just walk downstairs to The Promenade at Juhl. Here, you’ll find some of Downtown’s best restaurants, amenities and shops. Maintain a healthy living by frequenting delicious places to eat like Greens and Proteins or Le Pho Vietnamese Kitchen or start a night out with your friends at the Classic Jewel cocktail lounge. Feel good knowing that all your grab-and-go necessities are right outside your doorstep at the Downtown Corner Store. Who says living in Las Vegas can’t be convenient?